Atlantic Clipper's 2 day and 2 night trip is for the socialite at heart with a sense of adventure. As the largest boat in the Whitsundays, this mega yacht will give you the ride of your life. Your days will feature a combination of fun sailing and exploring the Whitsunday islands and Whitehaven Beach as you snorkel and dive through the gorgeous reef coral formations and exotic marine life. There's even more adventure at night, with dancing, great music and entertainment. Atlantic Clipper features the best facilities onboard for diving, the huge spa and the brand new 3-storey high waterslide! No experience required for diving but subject to medical conditions. *Diving is temporarily suspended on New Horizon. We are currently waiting to confirm return dates with the operators. Thank you for your patience. Waterslide - 3 storeys high! This mega yacht has it all and more, but you have to see it to believe it. Imagine a huge saloon equipped with a television, a large dining area, lounge and cocktail bar! There's also plenty of room on deck as well as the spa or take the plunge on the giant waterslide. Accommodation wise, choose from private doubles, triple share and quad share cabins all with air-conditioning. Why is Atlantic Clipper is so popular with the young crowd? 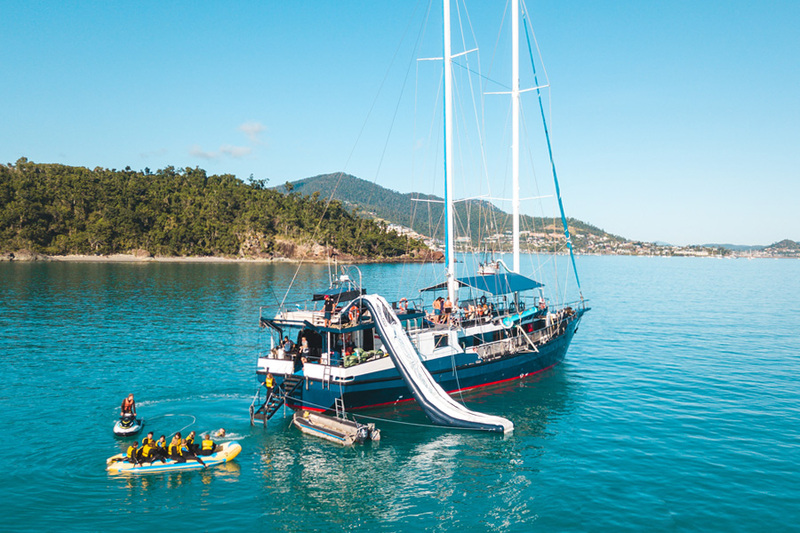 Atlantic Clipper is the Whitsundays best choice for the savvy traveller who wants an adventure that is clean & comfortable, fast & fun, with time to socialise and have a laugh. Perfect for 18-30s! Cruise around and see Whitehaven Beach, do a Scuba dive and chat with some like minded travellers after an exciting day on the spectacular Great Barrier Reef. It has everything you need on board. Sleep on board overnight, with 21 private cabins with 2, 3 or 4 people in each. The most popular feature is the awesome outdoor spa bath. imagine cruising past the Islands lazing in an open spa! Clipper also has a spacious saloon, sun tanning deck and it's fully air conditioned.The sheer size of Clipper gives you heaps of space and common areas so if you want to relax on your own, socialize with some new friends or hangout with the friendly crew you can. Atlantic Clipper was built in the UK in the early 80s and initially ran between the Caribbean and England. She came to Australia and was completely overhauled and made into a passenger vessel that would do blue water runs from Melbourne to Perth to Singapore and onto England so being originally built for long distance trips, she was designed with space in mind. Eventually she has made her way here to the Whitsundays and is now very happily cruising around one of the best sailing grounds in the world! Atlantic Clipper cruises at a comfortable speed to get you to as many destinations as possible. When the winds are light, she uses its enormous engine to cruise at about 9 knots. One of the highlights of the trip is visiting the pristine Whitehaven beach, weather permitting, and our customers rave about Whitehaven Beach being a highlight of their trip to Australia. A fully crewed diving team know all the best spots to scope out the best wildlife so you can scuba dive, snorkel or just swim at some amazing locations on the Great Barrier Reef Marine Park. One of the usual stops is at Luncheon Bay, a perfect place for a first scuba dive with its beach entry. Also they often stop at Langford Island for more snorkelling and diving which is also a great place to watch a beach sunset. Atlantic Clipper will generally have two dive instructors aboard, own compressor and two 6 metre tenders can transport passengers quickly to great beach and dive locations. Life aboard Atlantic Clipper is as active or relaxed as you like. Help the crew on board to hoist the sails or sit back in the on deck spa and have a beer or two and watch the sunset. What better way to spend a holiday! Described as an 8 meter inflatable adrenalin rush one person stands one end of the inflatable tube whilst another jumps from the 4 meter high deck of the Atlantic Clipper onto the other end, this sends the passenger sling shotting into the air on a high octane ride with some serious air time! !